From the acclaimed author of "The Pencil" and "To Engineer Is Human," "The Essential Engineer" is an eye-opening exploration of the ways in which science and engineering must work together to address our world's most pressing issues, from dealing with climate change and the prevention of natural disasters to the development of efficient automobiles and the search for renewable energy sources. While the scientist may identify problems, it falls to the engineer to solve them. It is the inherent practicality of engineering, which takes into account structural, economic, environmental, and other factors that science often does not consider, that makes engineering vital to answering our most urgent concerns. 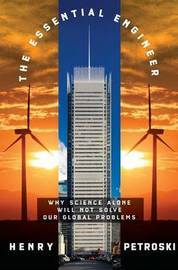 Henry Petroski takes us inside the research, development, and debates surrounding the most critical challenges of our time, exploring the feasibility of biofuels, the progress of battery-operated cars, and the question of nuclear power. He gives us an in-depth investigation of the various options for renewable energy--among them solar, wind, tidal, and ethanol--explaining the benefits and risks of each. Will windmills soon populate our landscape the way they did in previous centuries? Will synthetic trees, said to be more efficient at absorbing harmful carbon dioxide than real trees, soon dot our prairies? Will we construct a "sunshade" in outer space to protect ourselves from dangerous rays? In many cases, the technology already exists. What's needed is not so much invention as engineering. Just as the great achievements of centuries past--the steamship, the airplane, the moon landing--once seemed beyond reach, the solutions to the twenty-first century's problems await only a similar coordination of science and engineering. Eloquently reasoned and written, "The Essential Engineer" identifies and illuminates these problems--and, above all, sets out a course for putting ideas into action. Henry Petroski is the Aleksandar S. Vesic Professor of Civil Engineering and a professor of history at Duke University. The author of more than a dozen previous books, he lives in Durham, North Carolina, and Arrowsic, Maine.